Firefly is getting a second chance, at least in the trading card arena. Upper Deck announced that it has acquired the license for the Joss Weadon space western to produce new trading cards, games and stickers. The new agreement with 20th Century Fox also includes the Alien and Predator franchises. This isn't the first set of Firefly trading cards. Inkworks released a set based on the show in 2006. They also had one for Serenity that came out in 2005. Both sets featured autographs from key cast members Nathan Fillion, Morena Baccarin and Jewel Staite. 2006 Inkworks Firefly also boasts the only certified autograph card to date of Christina Hendricks, who has since risen to greater fame on Mad Men. Alien is no stranger to trading cards. Topps, Star Pics and Inkworks have all made sets based on the license in the past. The most recent covered both Alien vs. Predator and its sequel, Alien vs. Predator - Requiem. Both of these sets came from Inkworks and included autographs, costume cards and sketch cards. Predator has yet to have its own standalone set. Besides the Inkworks AVP sets, the Predator does have a couple of cards in the horror set, 1988 Topps Fright Flicks. The deal between Upper Deck and Fox reaches beyond just cards. Collectors can also expect games and stickers based on the Sci-fi franchises. 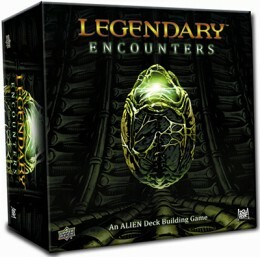 The first product released following the agreement will be Legendary Encounters, a deck building game based onAlien. Previous Upper Deck Legendary releases have centered on the Marvel Universe. Legendary Encounters is intended to be a standalone game but players can expect some elements to work with the Marvel components. "Bringing in the popular Alien, Predator and Firefly franchises to expand our Legendary Deck Building game portfolio just makes sense," said Jason Masherah, President of Upper Deck, via press release. "At Upper Deck, we aren’t looking to just push out dozens of different games, in hopes that one or two might succeed. We believe that it is more important to focus our efforts and invest heavily in creating what we know will be a great gaming experience for our audience." As for the trading cards and stickers? Upper Deck said they'll be announcing more specifics and release dates for all three franchises later this year.